Buy the Pathfinder Player Companion: Alchemy Manual cheaply from Amazon. You too can earn money from writing articles by signing up for InfoBarrel. 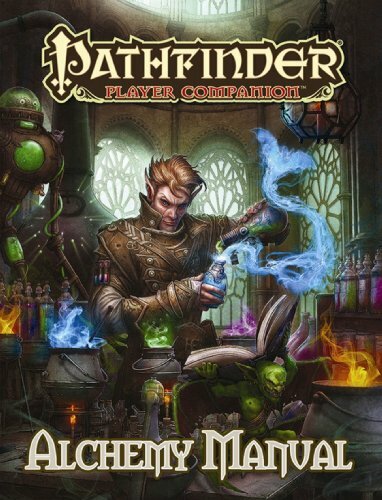 Pathfinder Player Companion: Alchemy Manual by Jason Nelson, Patrick Renie and David N. Ross is published by Paizo Publishing for use with their Pathfinder role playing game system. This supplement is part of the Pathfinder Player Companion Ongoing Subscription, but it can also be purchased separately. As the supplement is for the Pathfinder game, it is covered by the Open Game License and some parts are Open Game Content. The supplement is available as a 36 page watermarked PDF or as a printed softcover book. The version reviewed was the PDF, the normal price for which is $8.99, but it was purchased at the discounted price of $6.74. The PDF has two pages front and back full colour covers, one page Table of Contents and front matter, one page How to Use This Book and Rules Index and one page advert for other Companions. It doesn't have a chapter structure as such, but it is divided into various sections. Credit: Kerem Beyit/PaizoPublishingInside what would have been the printed book's covers are two pages of Alchemical Reagents. This have a number of these reagents listed, with illustrations, symbols, descriptions and game stats for them. What would be the centre pages of the printed book are Magic Flasks and Bottles, which have item details on four different magical flasks and bottles on a full page alchemically-themed background. There is one page entitled For Your Character, which has suggestions on how to use the book's rules for alchemical characters and for any characters. The main new rule is on Spontaneous Alchemy, which has details, feats, crafting tools and how to read alchemical recipes - provided through the supplement - on creating alchemical items. Most of the rest of the book is divided into eleven different organisations and categories of alchemical-related items. The different sections include such as more alchemical items, feats, reagents, tools, weapons, poisons and rules. The final two main pages of the book, excluding the advert and covers, are an Alchemical Recipe Index, which divides the new items into different categories, provides a quick overview of the relevant stats and the recipe, and a page number to look each up in more detail. The supplement is in full colour and beautifully and extensively illustrated. The illustrations do take up a fair amount of the book's pages, resulting in less content than might be expected. The PDF is well bookmarked, and there are three different types of index, making it easy to navigate. There are a number of new feats introduced, new items, both alchemical and mundane, new rules and a number of alchemical reagents scattered throughout the book. This does not work well as a standalone work; the organisations have a Golarion focus, which is Paizo's campaign world, although they could be adapted to other worlds that bar some similarities. The alchemical reagents can apparently also work as alchemical power components, which were first introduced in another Player Companion, Adventurer’s Armory. There are also references to other Pathfinder books. Alchemy Manual is a useful addition to the Pathfinder game that will probably also work reasonably well with other D&D 3.5 games that attempts to add some depth to the alchemist, but it's quite pricy for the amount of content.